Downtown Revitalization: Preserve, Rehabilitate and Promote, a Unique and Thriving Downtown. Downtown Killeen presents a unique opportunity for the city. In the downtown, there exists an opportunity to capitalize on what is authentic about Killeen and celebrate that uniqueness. Through the rehabilitation of buildings, the development of quality pedestrian friendly public spaces and by encouraging appropriate commercial development, the city can create a thriving social, cultural, and commercial location that will attract visitors and residents alike. Downtown revitalization is an essential component to the economic vitality of Killeen and, as a thriving commercial and social hub, can play a key role in attracting industry, business and the creative class. According to Richard Florida in The Rise of the Creative Class, “Regional economic growth is driven by the location choices of creative people – the holders of creative capital – who prefer places that are diverse, tolerant, and open to new ideas”. This “creative class” seeks interesting and diverse places to work. To the creative class, the importance of lifestyle opportunities supersedes, or is at least equal to, the importance of economic opportunities. They value authenticity and uniqueness and look for it in the musical, artistic, cultural and recreational opportunities found in a prospective community. This becomes increasingly important as cities struggle to be economically competitive and where national trends suggest that technology companies and venture capital dollars are now flowing to communities that have the talent pool that is essential for success in the changing economic climate. In this new economic model, downtown revitalization becomes a key element in attracting and retaining talented and creative community members by providing authentic and inviting public spaces so sought after by the creative class. Authenticity is that essential quality that defines and makes each community special and different. It combines all the “real” qualities of the community without attributing a value to what is good. Simply stated it is what is real, interesting and unique about the community. Downtown is the most authentic place in Killeen. There, one can find the “urban grit” Florida describes along with the banks, small businesses and offices of the working professionals. Downtown is the historic heart of the community and the community’s social identity is linked to that historic center.2 It is only in the downtown, where one can find evidence of the city’s unique history in the numerous significant historic buildings, sidewalks and signs. Additionally, the diversity of Killeen is showcased in the myriad of minority owned businesses where one can find Mexican, Korean and German owned businesses all within a five block area. Through its diversity of food and culture, Killeen can provide unique and authentic experiences to residents in and visitors to Central Texas. Nevertheless, downtown Killeen still lacks a certain inviting quality to make it appealing after hours - a reason for the working professionals to stay around and a reason for others to come downtown and hang out “…simply for the pleasures of good company and lively conversation” (Oldenburg). Historic resources abound but many are losing or have lost their historic integrity either through demolition by neglect or inappropriate alterations. Downtown should be the venue where the rich history of the city is showcased and celebrated in its architecture, public art, plazas, museums and other public spaces. Without these “story tellers” the city has no means to communicate its unique story to the community. Preservation and rehabilitation are two tools that will help downtown recapture and celebrate its unique past. Façade improvement and quality rehabilitation of the city’s historic resources will allow the city to tell its unique story through the charming architecture of its turn-of-century buildings and the exciting Modern architecture of the mid-century boom. Design guidelines will help build awareness and appreciation of our historic buildings while design compliance review and façade grants will work to promote the new rehabilitative standards. Other incentives such as tax abatement will help to foster economic development and adaptive reuse of the city’s historic buildings. Attractive historic buildings will set the stage for a celebration of the city’s past and will be the basis for revitalization of the downtown area. A quality museum will help visitors and residents interpret, understand and appreciate the unique story of the city. Opportunities to fund public art, that celebrates significant historic events and people, will help capture the attention and imagination of residents and visitors. When the city begins to celebrate its past – others will celebrate with us. Killeen should seek opportunities to celebrate one of its greatest resources, its diversity. Festivals, art shows and cultural events should promote and showcase the myriad of ethnicities that make up the community. Public art can be a medium for interpreting the cultural diversity of the city. The downtown sorely lacks cultural amenities. Sculpture, murals and monuments could be used to tell the story of the residents as the buildings tell the development story of the city. There are many cases across the United States demonstrating the positive impact that quality open space has on revitalization efforts. More pedestrian activity and more visitors in the downtown area help make the downtown more appealing to potential businesses. Public venues help to draw pedestrian traffic to the area providing a market to support the “niche” shopping evident in so many successful downtowns across the state and country. 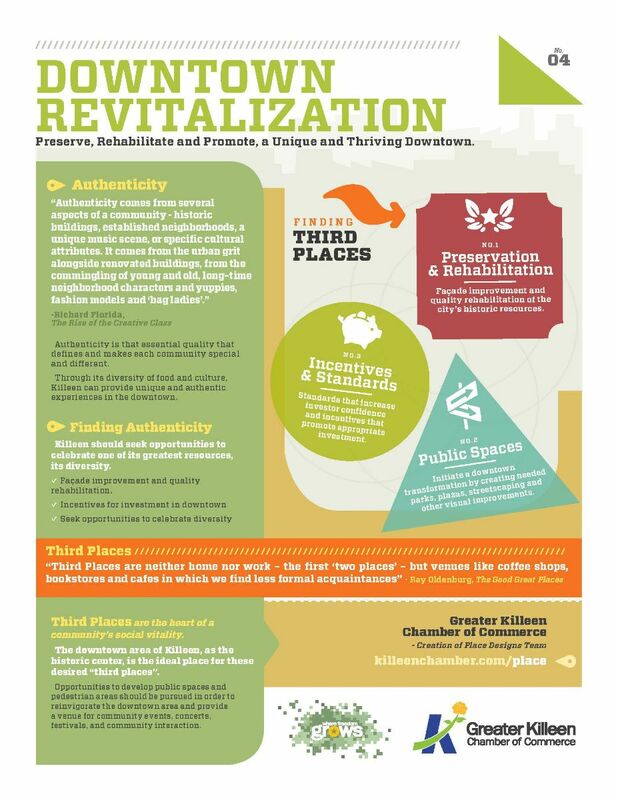 Public improvements, funded through the tax increment reinvestment zone (TIRZ), can help initiate a downtown transformation by creating needed parks, plazas, streetscaping and other visual improvements to downtown. Banners, historic lighting, sidewalks, and pedestrian crossings can further lend distinctiveness to the downtown area. Public improvements should work in concert with gateway improvements to create a recognizable visual appearance easily differentiated from the other parts of the city. Public Improvement Districts (PIDs) can also help to fund the development and maintenance of new public amenities. Ordinances can encourage appropriate residential development essential to supporting the commercial development needed to create a thriving downtown community where community members can live, shop and have fun all in the same place. Additionally, ordinances need to be developed that increase investor confidence and encourage appropriate businesses in the downtown area - businesses that create a unique shopping, dining, and/or social experience during and after the normal business day and provide a venue for formal and casual social interaction. Other public improvements such as an enhanced and clearly identifiable farmers market will help bring residents and visitors into the downtown area year round enhancing commerce in the area and bringing revenue to our local vendors and merchants. Currently, downtown is difficult to find for visitors and new residents. The location of the downtown makes finding and promoting it to visitors and residents difficult but not impossible. Wayfinding signage can help direct residents and visitors along newly improved gateways to the downtown area. Historic overlay standards and design guidelines will set a standard that ensures development and redevelopment occurs in a way that protects the historic character and charm of the downtown while encouraging new compatible development. Ordinances and incentives can also address what type of activity is appropriate for downtown by encouraging the right mix of commercial activity. “immeasurable.”5 Specifically, Mr. Yantis cites the downtown as one of the main factors in the city’s economic development success. Successful attempts to attract corporations such a Citicorp and Toyota have always included a trip to the downtown with visiting corporate representatives later citing the downtown as a factor they considered when selecting Georgetown. In Ft. Worth over $400 million of private investment has come downtown since the City began downtown revitalization just twenty years ago transforming downtown from an economically distressed crime ridden section of town to one of the biggest tourist attractions in the state. 1 - Florida, Richard, The Rise of the Creative Class; Cambridge MA: Basic Books 2007. 2 - Oldenburg, Ray, The Great Good Place: Cafes, Coffee Shops, Bars, Hair Salons, and other Hangouts at the Heart of a Community. New York: Marlowe and Company, 1989. 3 - The Trust for Public land, Revitalizing Cities. http://www.tpl.org/. 1999.